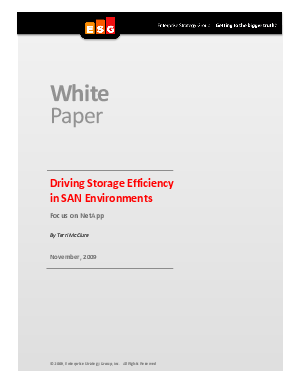 Time and again, ESG research finds that data growth is cited as a top IT storage challenge. IT organizations large and small are inundated with data that needs to be stored, managed, and retained (for a period of time that is usually classified as "indefinitely") all while remaining accessible 24x7. With disk drive density growing and prices falling, organizations rarely delete data. It is less expensive to store all data forever than to find and delete data that is "safe" to get rid of- Find out how NetApps can ensure your storage becomes more efficient.